Last Friday, on December 6, 2013, the Minister of Health introduced Bill C-17 in the House of Commons. The Bill passed first reading. Bill C-17 is a partial return of Bill C-51 which had been introduced on April 8, 2008. Because Bill C-51 became a matter of significant public interest, we believe that all those involved in the natural health community should study Bill C-17 to determine how it may affect them. Olive Branch or Trojan Horse? Bill C-51 created significant public backlash from Canadians who were concerned about their access to natural health products. We were told by some long-term Members of Parliament that it was the largest public reaction they had ever experienced. During the Bill C-51 fight I attended a meeting at the Prime Minister’s Office. At this meeting the then number two at the Ministry of Health was asked if he had read the NHPPA discussion paper on Bill C-51. We were told that people writing to the Minister would staple the discussion paper to their letters and as a consequence the mail had to be moved with wheel barrows. Because the public reaction to Bill C-51 was so severe, we believe that the Government has been reluctant to threaten natural health products with legislation. On our first read of Bill C-17, our initial reaction was that it was drafted to ensure that natural health products are not threatened. In other words, it appeared to be an olive branch to the natural health community. 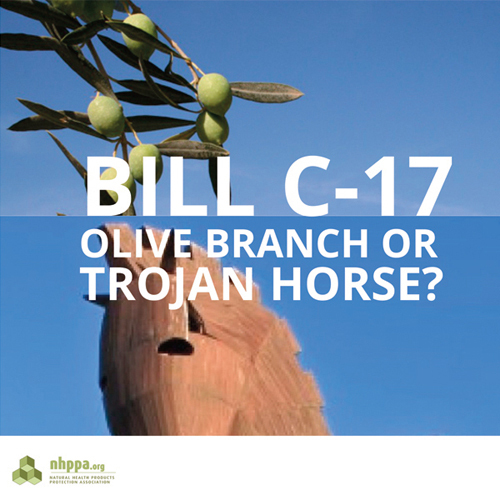 After further reflection, we became concerned that Bill C-17 could later act as a Trojan Horse that surprises the natural health community with Bill C-51 provisions. Bill C-17 also gives the Minister significant power to take control over property, and to potentially adversely affect health, without any court oversight. Philosophically we understand that any move away from the rule of law is dangerous. This is doubly so in the area of health. The NHPPA remains your watchdog, researching, writing and advising to protect you, your business and your rights.